There's been lots of progress in the kitchen the last few weeks and I thought it might be time to share a quick peek. You might remember the floor plan from our previous post. And now, it's starting to become a reality! The first step was rewiring the space. That meant tearing all the walls open (but that also provided the opportunity to add more insulation). We needed all new GFCI electrical outlets as well as lots of lighting. 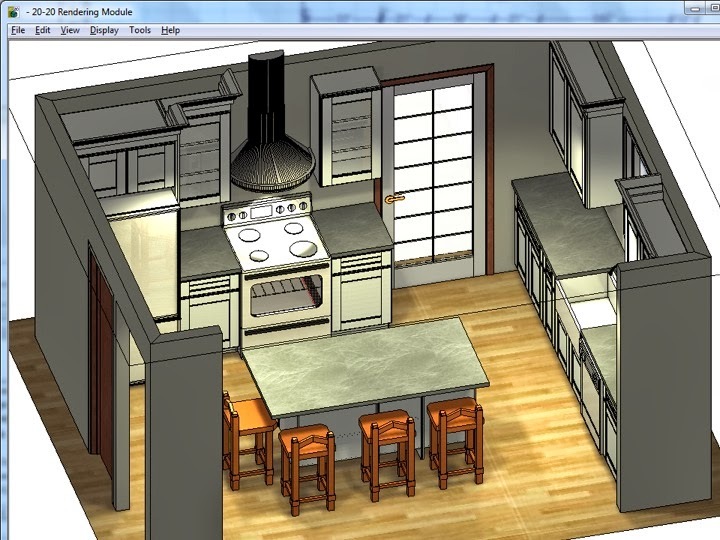 Lighting comes from multiple sources: recessed cans, island pendants, under counter lighting and in cabinet lighting. It's going to be pretty dramatic when we get it all hooked up!. The next step was flooring. 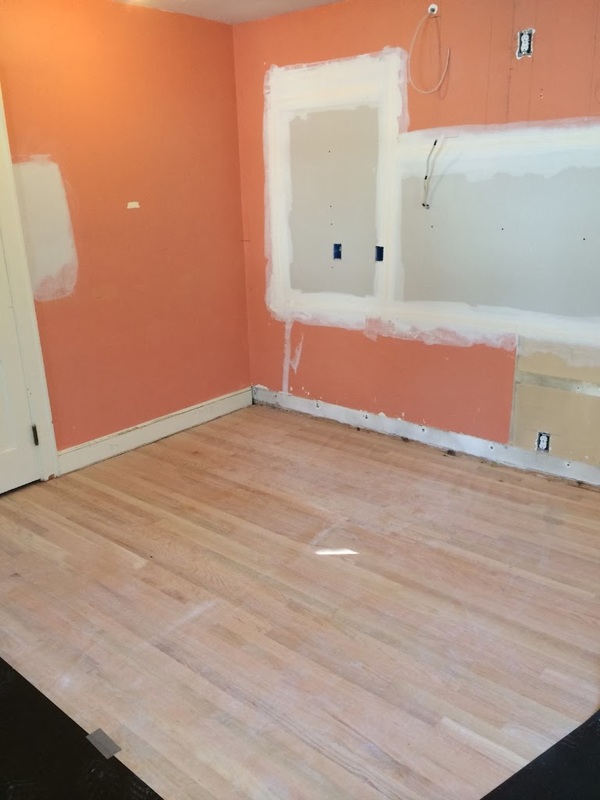 There were 3 different flooring types in the old kitchen - fir, barn board and plywood - all covered with multiple layers of vinyl. Obviously, we needed to change that! We have red oak throughout the rest of the first floor and wanted to seamlessly blend new oak with the old. The guys did a great job tying it all together. Once it was in place, we covered it up to keep it safe during the rest of the construction process. 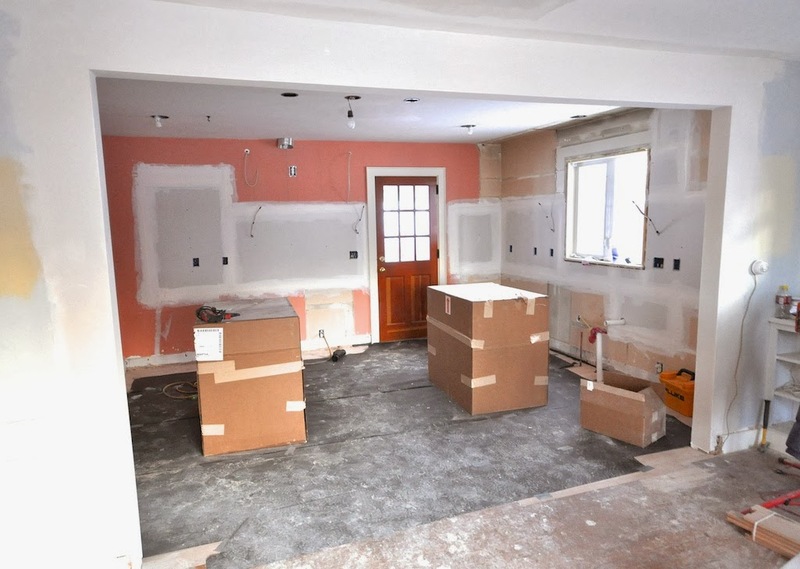 Now that the wall has been removed between the living room and kitchen, this space is completely open and it's amazing how light and bright the space is! The team from Waterhouse Builders quickly got to work. 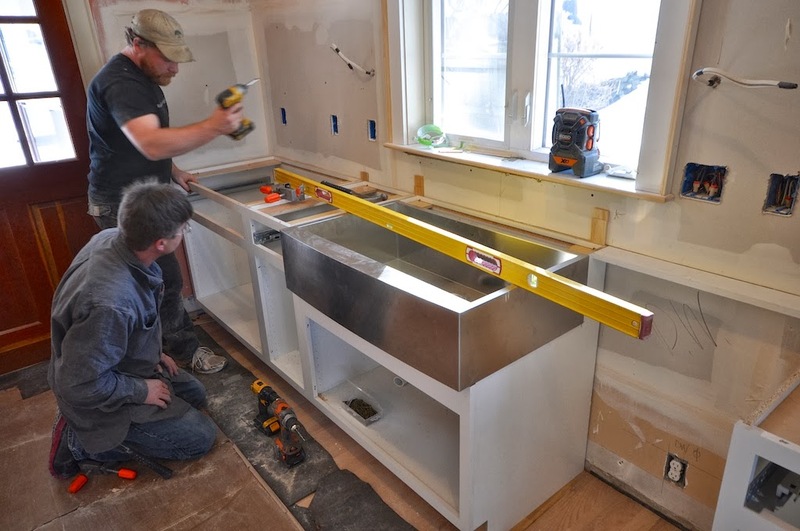 The giant stainless steel farmhouse sink is looking gorgeous already! 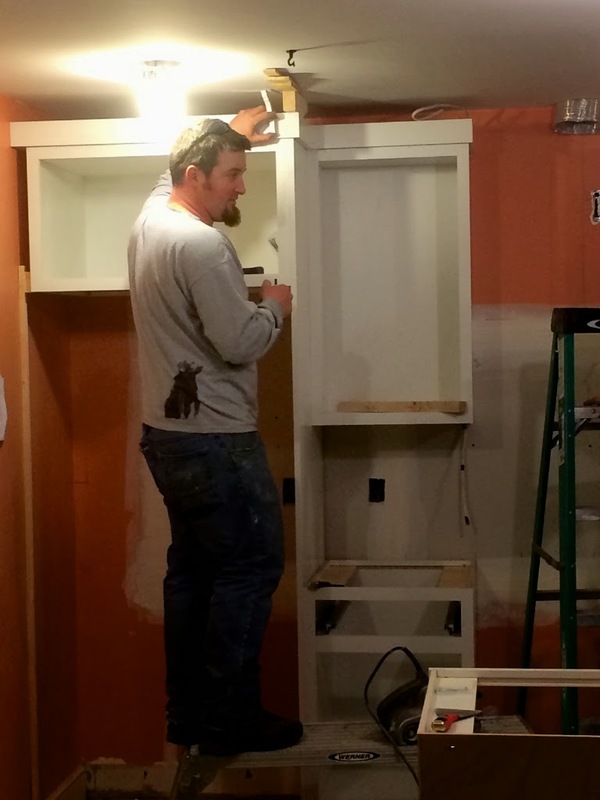 Once the upper cabinets were up, they started the exacting work of installing the crown molding. 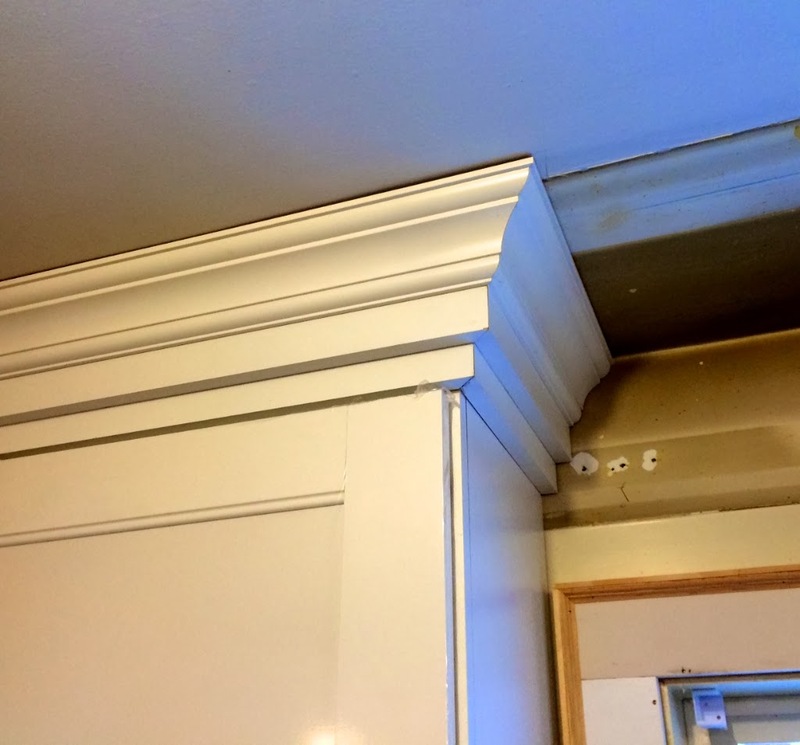 It's a tricky process, because we're using a complex build up of intricate molding to add lots of definition. And we're thrilled with how it's coming out! 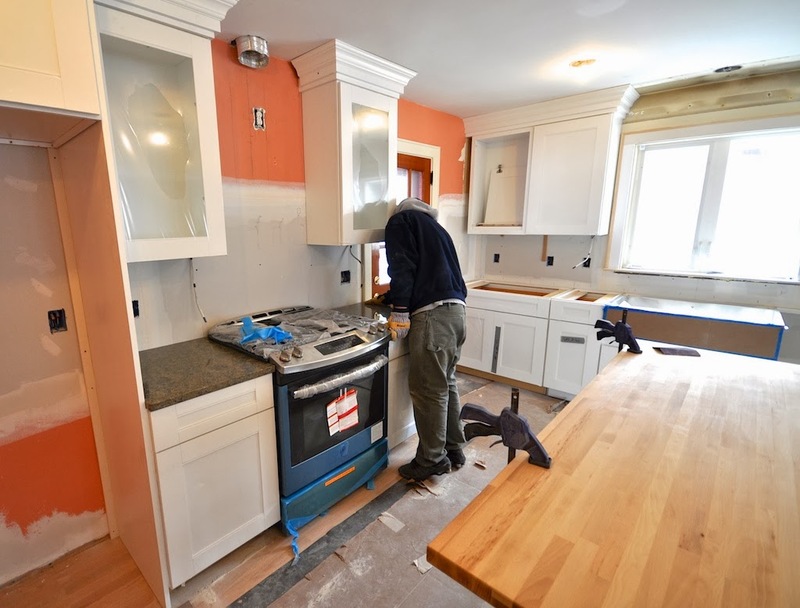 The next step was countertops. The countertop pattern was created with a paperless laser system. 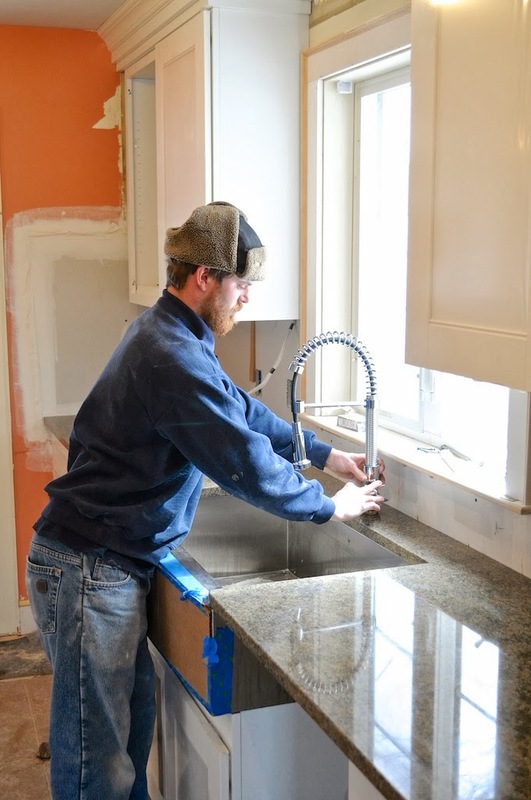 The countertops are made of quartz and are difficult to modify on site. So it's important that the template be completely accurate. This is the first time we've used quartz and I love that it needs no maintenance and is incredibly scratch resistant. The color we've used is Wildwood and it's a great blend of brown, cream and black. What a striking contrast to the white cabinets. 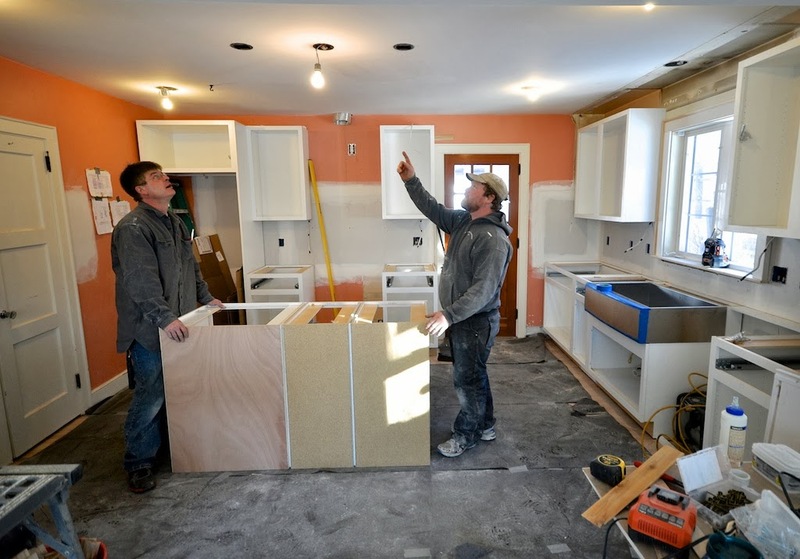 There is a two week wait for fabrication, but this morning they came back to install the countertops. LOVE them!! For the island, we wanted to warm up the space, so we're using a butcher block top. There's something about glowing wood tones in a kitchen that just makes the space seem 'homey'. We will shape the edges to give it a little more style and had fun playing with placement for the stools! There's still more to do. I get to install the beautiful tile backsplash and then the vent hood can be mounted. Of course everything needs to be painted. 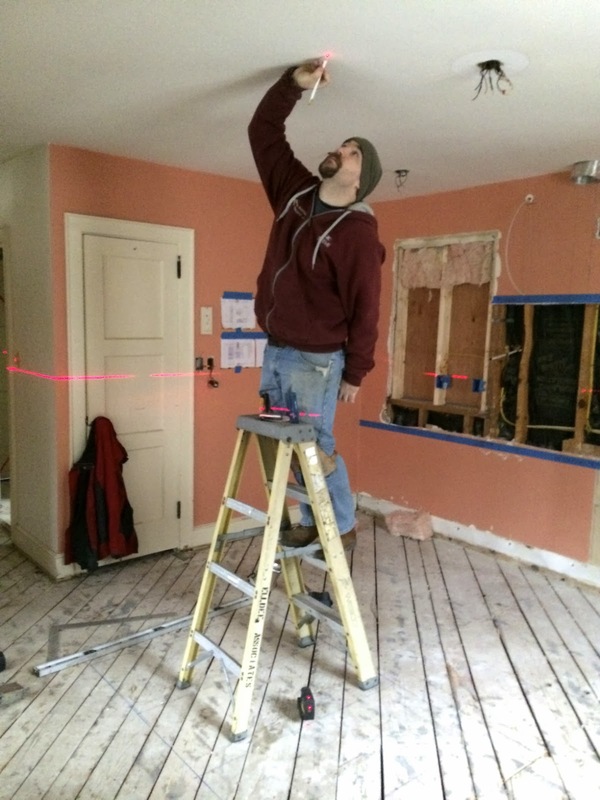 And then finally, the light fixtures will be installed. So we've not done yet, but what do you think so far? it seems you work with very talented craftsmen! i just wanted to give a shout out to the company Watertown Builders that you work with on most of your houses. they do beautiful work . (i don't live in the area and have no affiliation with them nor know them in any way.) just appreciating their craft. The crown molding is awesome! The countertops are cool. Wait. The entire kitchen is just phenomenal. 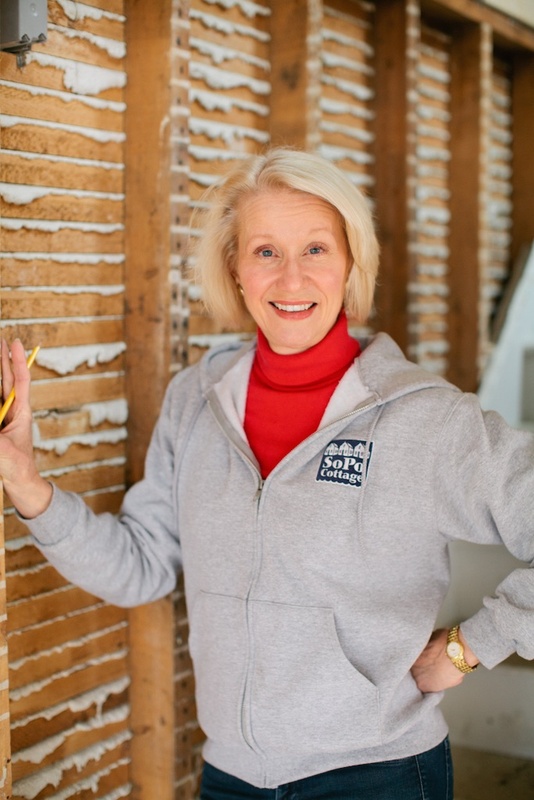 Please share the crown molding layering process that you did. It looks great! And I love the countertops as well. The tricky thing with full overlay doors is that you need to build a box on top of the cabinet box, to pull the molding forward (otherwise is looks like it's recessed behind the door). The guys created the box and then built another reveal on top of that for the actual crown molding. Adding to the complexity was a very out of level ceiling. There was a lot of frustration, but the final product came out beautifully! It really did come out beautifully. Thanks for the details, Laurel. LOVE LOVE LOVE every project you work on! Giving me some amazing ideas for my own home! It looks just beautiful, Laurel. Any ideas when it might be ready for sale. Is the one car garage useable? Are you going ahead with the large soaker tub & shower up stairs in the master? Sorry..... this is a house that we finished and sold back in 2014!